She's Sew Crafty: Mo's Monthly Blog Hop!! It's time for another Mo's Dream Team Blog Hop!! Hop around and leave comments for a chance at some prizes while getting some wonderful inspiration! Our theme this month is 'Borders'. You should've come from Anneke's blog. If not, you can start at Jak's, the host of this hop! I have used the image, My Friend, for my card. I have used a scallop 'border' around my image and I love how the leaves on the image crawl up the fence like a border. Here is a close-up of the image. Don't forget to leave a comment to be in the running for a prize! Your next stop is Kaly. Happy hopping! Wow!!! that is so talanted coloring!!! How beautiful is this coloring! This card is stunning! What a amazing card, Danielle. Beautiful! What a darling garden scene card. Love your use of flowers and embellishments. I can't believe the detail in coloring, even on the fence. This is sweet perfection! So beautiful. I agree with Tracy - the detail in coloring. LOVE, LOVE, LOVE! How cute is´nt this. Love how you have built up this scene. And so beautyfull coloured. Pretty Pretty Pretty! All of your embellishments are fantastic and MM should be proud of how you've colored her image. Great job. Very cute - amazing coloring! Peek a boo!! Such a sweet card! Beautiful card and I love that image and your coloring! This card just makes me smile. I love the coloring you have done especially on the fence. She is just precious. WOW! This is stunning! Such a sweet image, amazing colouring and gorgeous detailing. 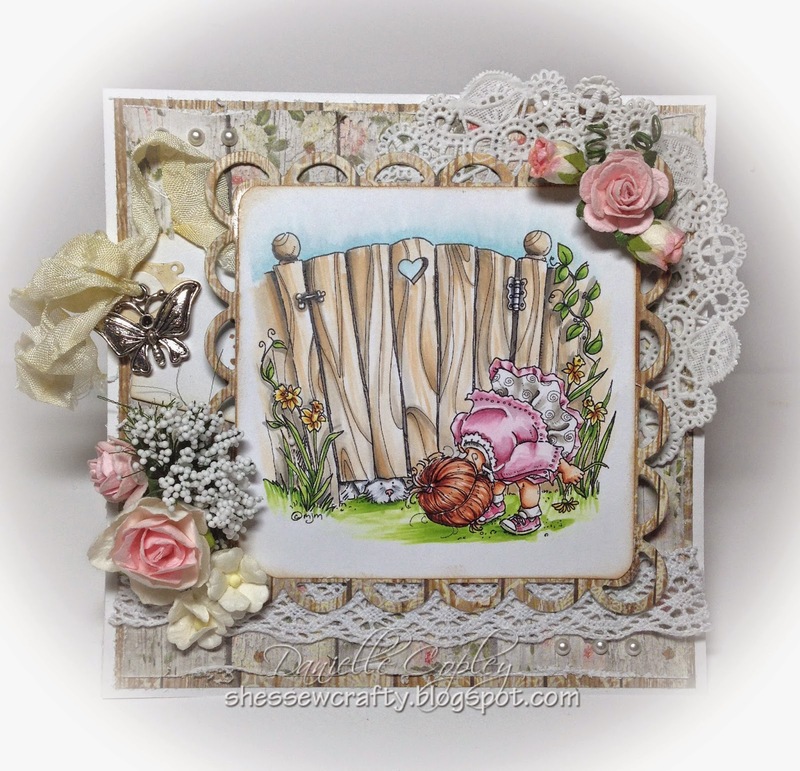 Thank you for the inspiration and for a fun blog hop. I'm speechless Danielle!! 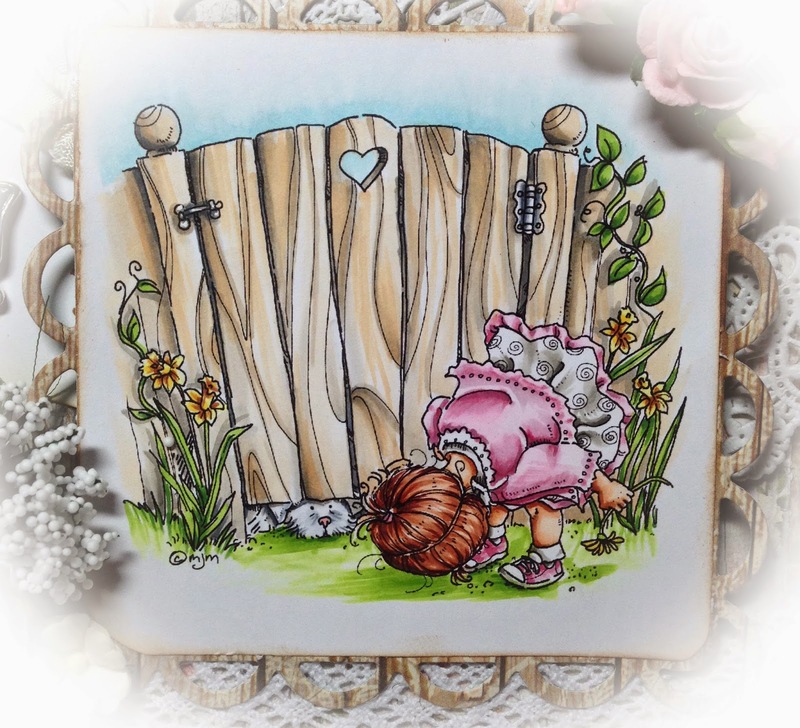 Couldn't be a sweeter image...and you have just colored it perfectly, and your borders complement so well...gorgeous!! This is precious, Danielle. One of my favorite images... peeking under the fence at the pup! Gorgeous design and embellishments. What a gorgeous card. .. everything about it. Your coloring is phenomenal. Your coloring is great. Looks so nice.